1. Marshall D. Eclodemal dyspìasia. Am J QphthabnoÍ 1958;45: 143-156. 2. Shanske AL. Bogdanow ?, Shprincfn RJ, Marion RW The Marshall syndrome: report of a. new family and review of the literature. Am j Med Genel 1997;70:52-57. 3. Stianon R, Lcc B, Ramitc; R Marshall syndrome. Am J Med Gentt 1991:41:35-38. 4. Griffith AJ, Spnmger LK, Sirko-Osadsa DA, Tiller GE, Meisl« MU, Warnian ML. Marshall syndrome associated with a splitting defect at the COLIlAl locus. Am } Hum Cemt 1998;61i 816-823. Figure 1 . The patient 6 months before the onset of cataract. Noie the characteristic facial features of Marshall syndrome. We examined a 10-year-oid girl with a known diagnosis of Marshall syndrome since the age of 3 years. At the age of 2 years, she was noted to have an axial myopia of 22 D and bilateral lattice degeneration. Based on clinical findings of high myopia, sensorineural hearing loss, characteristic facial appearance with mid-facial hypoplasia (Fig. 1), and lack of ardiropathy, the diagnosis of Marshall syndrome was made. Recently, she presented to us with a 1-week history of nausea and vomiting. There was no history of trauma. 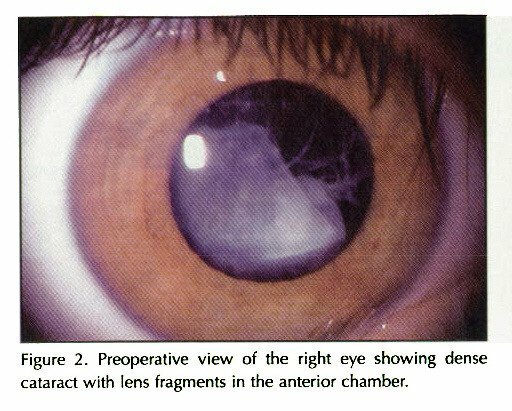 An ophthalmic examination of the right eye revealed a hypermature cataract with lens fragments in die anterior chamber (Fig. 2). Intraocular pressure was 56 mm Hg with an open angle. Results of an examination of the anterior segment of the left eye were normal with no evidence of lens subluxation or lenticonus. The intraocular pressure was normalized with an ti -glaucoma eye drops and the patient underwent cataract surgery 2 days later. 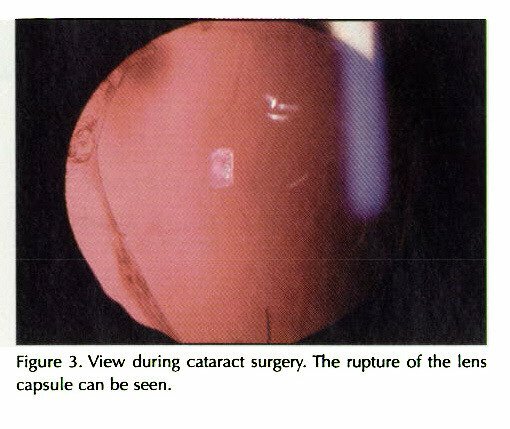 During cataract surgery, it was noted that both the anterior and the posterior capsule were ruptured (Fig. 3), with lens debris seen in both the anterior chamber and the vitreous. After most of the lens material was removed, a fundus examination revealed a large nuclear fragment in the posterior pole with no retinal detachment. No intraocular lens was implanted and the wound was closed with no further intervention at this stage. One week later, a standard 3-port vitrectomy was performed to remove the residual lens fragment and iens capsule. No retinal pathology was seen intraoperatively. At 6 months of follow-up, visual acuity had improved to 20/30 with +1.00 + 2.00 X 80 correction. Her intraocular pressure was 12 mm Hg. The left eye remained clear with no evidence of rupture of the lens capsule or cataract. Figure 2. PreoperalJve view of the right eye showing dense cataract with lens fragments in the anterior chamber. 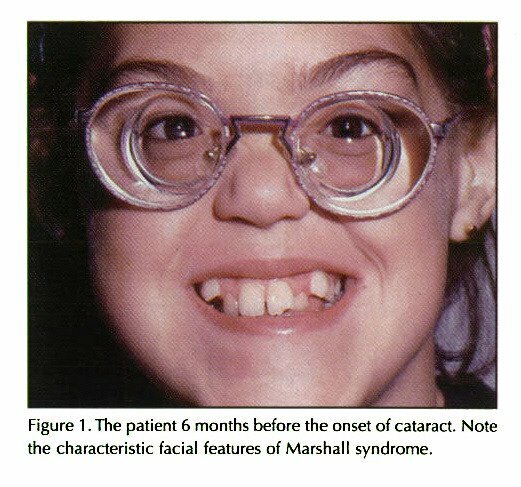 Marshall syndrome is a rare autosomal dominant condition with complex skeletal and ocular manifestations. The pathogenesis of Marshall syndrome has been found to be related to a defect in type 2 collagen, which is found in many body structures, including the lens capsule. This defect may make the lens capsule inherently weak, leading to rupture of the lens capsule either spontaneously or with minimal trauma. Prompt recognition of these conditions and appropriate surgical intervention can result in a good outcome. Figure 3. View during cataract surgery. The rupture of the lens capsule can be seen. 5. Endo S, Hashimoto Y, Ishida N, !insano Y, Ohkoshi K. Yamaguchi T. A case of Marshall syndrome with secondary glaucoma due io spontaneous rupture of the lens capsule. Nippon Ganka Gakkai Zaxhi 1998; 102:75-79.